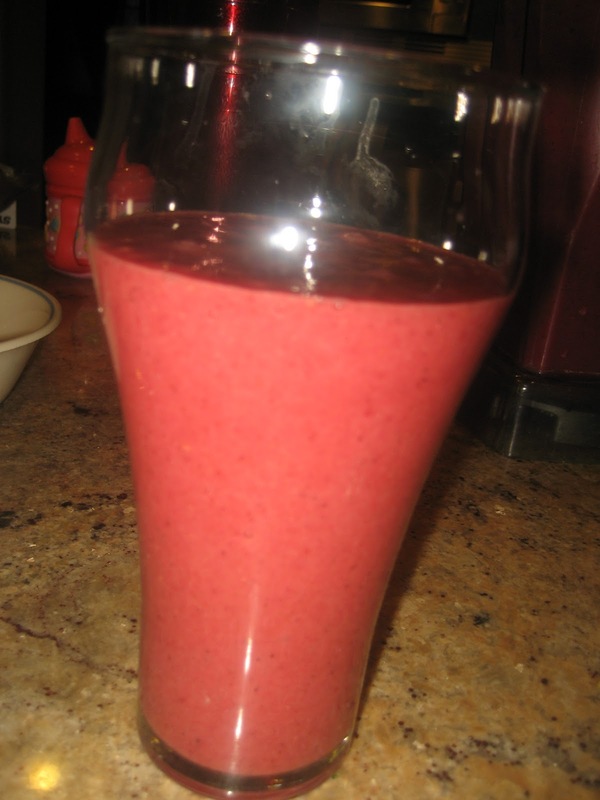 Daily dose of fruits smoothie – Drink Up! Ever since we got out Vitamix, which i want to say is about 4 years, at least, we have had the morning ritual of fruit smoothies going – I remember clearly, we were in Queenstown, NZ and every morning, we would walk down the main drag and there was this incredible smoothie/fresh juice place. The Fruits and veggies looked SO fresh and SO inviting and tasted SO delicious that we came back and as providence would have it, Sam’s Club was having a promo on Vitamix, we grabbed one right away! I must say that the Vitamix has been the best addition to my kitchen helping me grind idli batter, giving me smoothies, lassies, chutneys, thogayals, soups –you name it..Vitamix, I LOVE you! But Any blender will do the trick! But seriously the beauty is they blend in so well, unless you want to be fussy about it, it is totally unnoticeable. Now I present your 5 servings of fruits a day in one delicious glass – Drink up! Tip for moms with little ones who don’t like their fruits – Blend the fruits and add their oatmeal or rice cereal and feed. MY little one has practically been raised on this since she started on solid foods. Best breakfast thing ever!! I think all of my comments sound the same now!!!! Lovely smoothie. You are so right about Vitamix, any blender will do but with Vitamix you don't have to discard the fiber as it blends everything perfectly. What a great way to "beef up" a fruit smoothie. Healthy and delicious! Didn;t know our ellandha pazham had so much nutrients in it! Healthy smoothie, beautiful drink to kick start a day..
Yumm…The color is so soothing!! Have to give this the 2 thumbs up! Have had it – it's super and quite filling too! wow great nice Info. One can get so much knowledge from it. Wow, that's definitely the healthiest entry to Breakfast Club this month, I love the science bit! The great thing above the post is is uniqueness. Thanks priya,for stopping by my site and leaving a wonderful comment.Happily following you.What a fresh start to the day with a delicious and nutritious smoothie!